Now let’s consider the idea of a product’s cost being completely different based on weight versus volume as it applies to thermoplastic microspheres (AKA bubbles or balloons), those ultra low-density additives that are available in unexpanded and pre-expanded grades. These organic thermoplastic shells are sold by the pound. When compared to rigid microspheres/additives on a pound basis, they appear expensive. To make a fair cost determination, however, you should base your comparison on volume, not weight. Dualite is available in various densities and price points. By considering the following information, you will have a better understanding of how to compare the cost of microspheres/ fillers based on volume rather than weight. Dualite Expanded Microspheres –Sold by the pound. Prices range from $3.00 per pound to over $12.00 per pound, depending on density. The higher the density, the lower the pound cost. Ultra-Low Density – These expanded grades range in density from 0.03 g/cc to 0.135 g/cc. They have either an acrylonitrile copolymer (ACN) shell or a polyvinylidene (PVDC) shell with a small amount of a hydrocarbon gas in the center. The shell is coated with calcium carbonate or aluminum trihydrate, which keeps the microspheres from being dust explosion hazards. Because of the microspheres’ ultra-low density, they have a very low volume cost. You would think it would be impossible for a $10.00 per pound microsphere to reduce the cost of a formula that uses a $1.00 per pound resin. To get the true value of the microsphere in the formula you need to look at it on a volume basis. A .03 g/cc microsphere at $10.00 per pound has a gallon cost of only $2.50. The resin or filler with a density of .90 g/cc at $1.00 per pound has a gallon cost of $7.50. 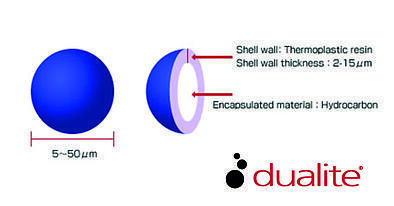 Dualite Unexpanded Microspheres – Have a starting density around 0.1g/cc. Their pound cost can be as low as $5.00 per pound to $20.00 per pound depending on the bead. This seems expensive compared to other fillers, but you need to consider the expansion ratio of the microsphere and the maximum final density. It is easy to view most rigid filler/microspheres as inexpensive based on their pound price compared to thermoplastic microspheres. But if you do the math and convert to the gallon cost, you will be pleasantly surprised. Dualite Microspheres may be the best choice for cost savings in the long run. If you would like a more in-depth consultation or have any questions regarding this article please contact us.